Does anybody know who this guy that's having a free concert tonight at 11PM in front of Bert Green is? 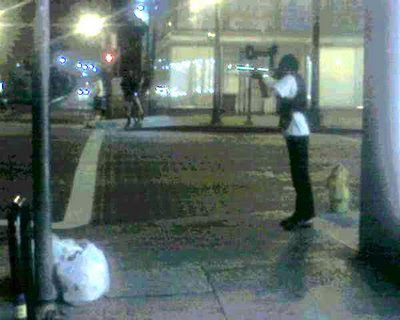 At first I thought of Nathaniel Anthony Ayers from reading Steve Lopez on L.A. Times but then hey, he's bringing 2 white plastic bags and a trumpet case (I think, not 100% sure), but not a violin. Any idea? He actually CAN play. Nice! Where do nut cases date?